Dr. Brad Murray. Lucknow Chiropractic. Dr. Brad Murray loves to help patients achieve the wellness needed for a happy life. 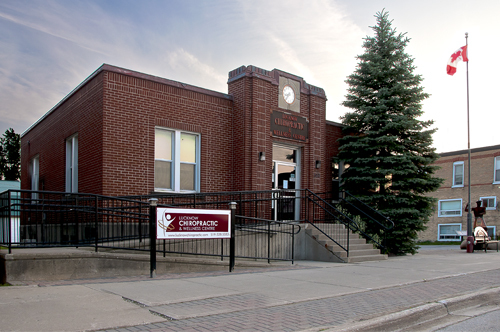 Here at Lucknow Chiropractic and Wellness Centre, in Lucknow, we want to be your coach in your health care decisions, giving you the information you need to allow you to make informed decisions about your health care. Realizing that your spine and nervous system controls the function, healing and recreation of your body is the first step in understanding chiropractic. When your spine is in the correct alignment, flexible and moving well, your nervous system is able to communicate to the rest of your body thus maximizing the body’s function, healing and recreation. This is the way your body was designed to operate! Please browse through our site to find out more about what we offer. We offer low force instrument adjusting with the Activator instrument, and the Variable Frequency Adjuster (from Sigma), Cold Laser Therapy from Theralase, Custom Orthotics from The Orthotic Group, and non-cusutom orthotics from Superfeet. Chiropractic is safe, natural and effective, and you can discover more by reading our past newsletters and visiting our health library. Call us at 519-528-5083 and begin your journey to wellness!